Has it really been a year since I began this self publishing journey? So much has happened in this short time. Actually it took three years to come to 2015. Before that, I spent decades in a world of publishers. In those days, the way was set and there was no other path. If you wanted to be published you had to find a publisher which could take years. You spent a lot of time looking for agent and publisher emails. Some of them, yes, even today, want the old snail mail and not email. You had done your research and then you prepared your query letter as carefully as if for god. You waited patient or inpatient, but you waited. Sometimes, you got no reply. If you did get a reply it was often a curt dismissal. Your self esteem, if you had any left, hit the floor. You took days and much effort to recover from a rejection but that, they told you, was the author’s way. Yes, it used to be the author’s life and it was a very tough one. When you write, you are emotional and open. You are by yourself or among writing friends. Nothing prepares you for the publisher world when your tender butterfly meets the shark. From the dreamy world of wispy imagination you now have to deal with the teeth of contracts and legalese, non competes and ebook rights and the terrible fangs of rotten contracts. It’s a nasty road and very painful but who cares for writers anyway? It’s a self sustaining environment. You are told, over and over, that there is no other way. You need a publisher and you need their approval. Without that writing anointing, you are nothing. Your fragile child must be turned over to rough hands to be assessed in financial terms. mangled or rejected. And you must take it with a smile and say, thank you. So, there I was, limping on the accepted path. Then I heard the first murmurs about ebooks and self publishing as a viable option and not the notorious vanity presses. I learned about Kindle Direct Publishing. Wow, you mean I can publish without cost, keep all the rights and get 70 percent of every book, with detailed accounts and regular payments? Isn’t that a fairytale just too good to be true? Isn’t that a story made to snare unwary authors? I heard that from many people. It’s easy to believe. Writers have been so battered and abused that is hard to believe there are fair and decent terms out there. But my own research showed me something. I read all the blogs and haunted the writing forums. It was true. Yes, it was true. It took me three years to decide to take the plunge. In 2015 I knew I would go for it. The first ebook was the toughest. I had to learn how to do it. I collected my flash fiction into a book. Figured out how to do the cover with a basic painting and some photo editors to give it texture. I edited every word several times. But the big problem lay ahead – formatting. I had no idea how to do it so I gave it to a company to do. In September last year my first ebook, To Catch a Falling Star, was published in silence. No fanfare, no book readings, nothing but a blog post and emails. Nothing but a feeling of great and deep satisfaction. Yes, I knew I liked this path. I had to figure out how to do it myself. I had to undertand the formatting so I downloaded the books and studied websites. 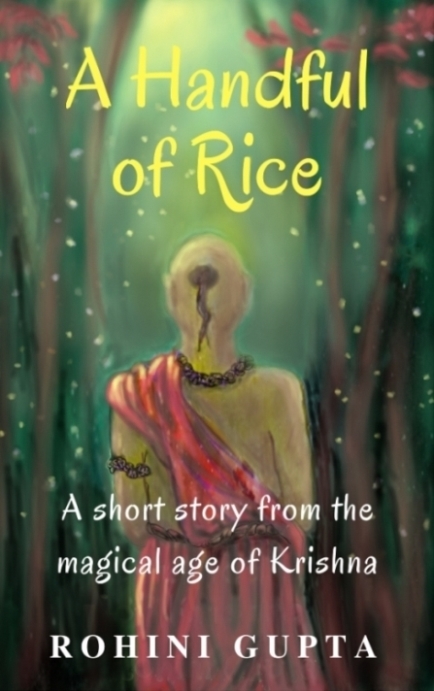 In December, a short story, A Handful of Rice went up. This was was even more satisfying because I had done it all myself, the cover, editing, formatting and uploading to Amazon’s KDP. Book 3, whiskers and purrs, a collection of cat haiku went up in February 2016. I put together a book of short meditations, 5 Minute Delight, which went up in May. In July our haiku group published our first anthology, A Taste of Sea Breeze. 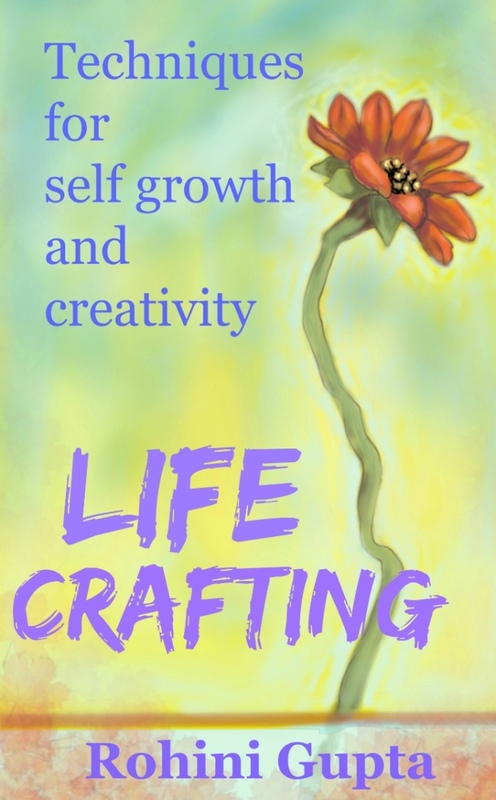 And in August, I published Life Crafting, Techniques of Self Growth and Creativity. My sixth book in the first year. I thought it took a year to write a book but I discovered that it takes publishers a year, not writers. I started out with the idea of publishing one book and went on to do six. I thought it impossible but it was not even stressful. I enjoyed every moment of it. Sales have not been great but they have been selling. I know this is a marathon and will build up slowly. I am in no hurry at all, as a I plod along writing the next book. The strange thing is that when I was a child, imagining the writers life, this is what I imagined. The great satisfaction of writing and publishing just as I please. Then I grew up and ran head first into the wall of the publishing world. From then on, it was a struggle. Now the delight and the easy playful creativity is back without the stress and struggle. The year was not yet done with me. I do workshops at Somaiya Center for Lifelong Learning and I suggested one on how to publish your own ebook. I put together everything I had learned in the year so that others could do this too. I had no idea what the response would be but there were lots of queries. The workshop was full, the people who showed up were really interested and Midday and DNA both covered it. This is the DNA article. And so the first year ended on a high note, with a workshop. My first ebook expanded almost effortlessly into 6. And now, a short respite, a trip or two and Diwali break, before I begin year 2. I know it will be better than the first as my self publishing journey goes on. There is quite a bit of interest in my workshop on how to publish your own ebook at low cost. Maybe because I don’t know any others who are doing this kind of workshop. When I wanted to self publish my first book I had no idea what to do. It was a very confusing world and it took me ages to figure it out. Now I have six ebooks out and feel I know a little. I have been working on my notes to make this workshop as comprehensive as possible. Here are the details of my workshop. If you always wanted to publish your own book but had no idea how to go about it, come across to Somaiya Centre on the 1st of October. Saturday, 2 to 5 pm. 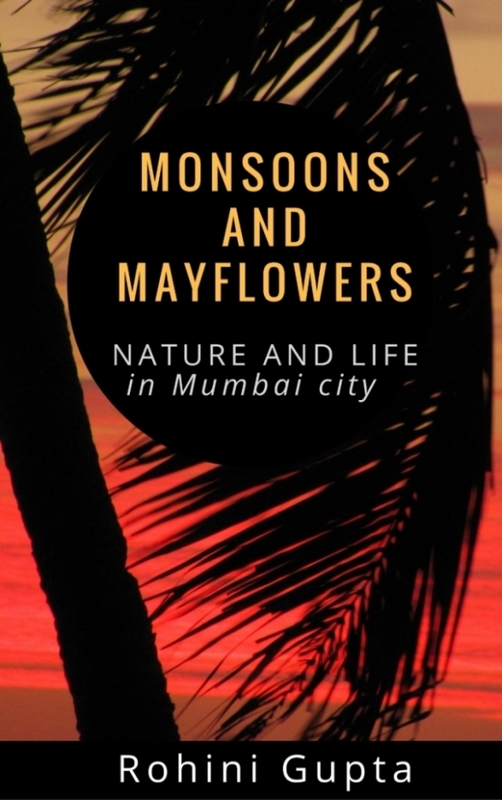 Its finally out, the anthology of our Mumbai INhaiku group. After two years of monthly meetings, even in the pouring rain, we put together a collection of haiku and related forms. Its been fun getting it together for our second year. Everyone cooperated and helpd with the sometimes tedious task of editing and formatting. 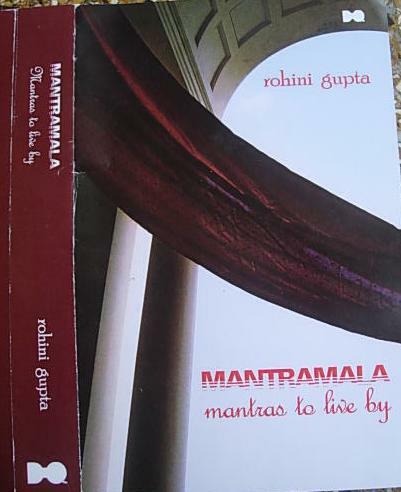 So here it is our first anthology. 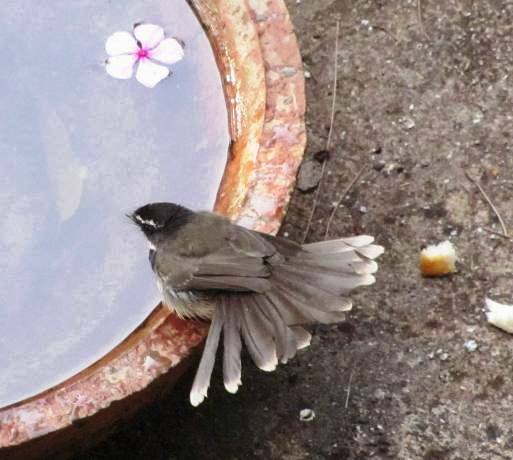 Take a look at haiku and senryu, tanka and the collaborative form of renku. And a new form too – renbun. Here it is. Available as an ebook from Amazon and you can download it free with a Kindle Unlimited subscription. My fifth book in the self publishing journey and this one was great fun to do in collaboration. I also enjoyed doing the cover – summer fishing boat – a very Mumbai sight. You often see these brave little boats with colourful flags even in rough seas. One of the things I really enjoy is being able to do my own cover. Of course, it is a time taking process and I conceptualize the cover when I begin the book. The cover is ready long before the writing and helps to keep me focused during the long process of writing, rewriting, editing, formatting and uploading. I put it as wallpaper on my phone to keep reminding myself. My minimal art experience, and a lot of study, is now coming in useful. I draw the central image first, digitally, and then add texture, backgrounds and all the rest. 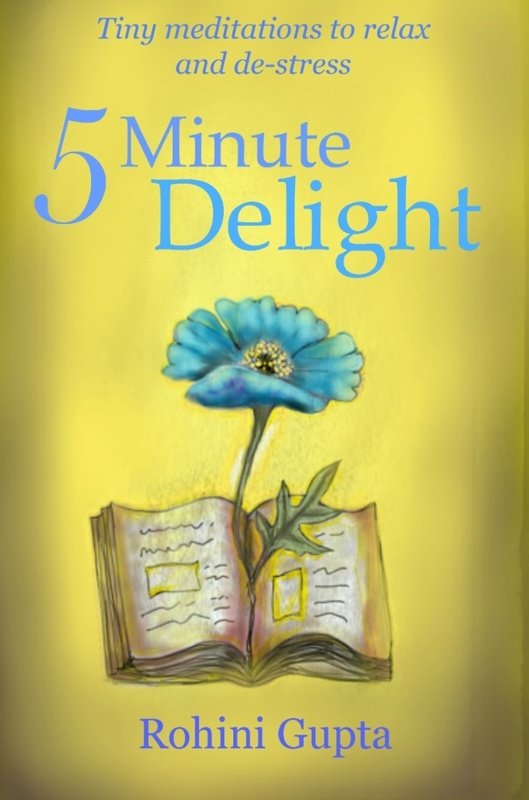 This is the cover for my latest book, 5 Minute Delight. It went through many steps to get to this point. After I published the book many people told me that they really loved the cover. It took a long time to get there and these are the steps – and some missteps which I took. The first ideas did not work. I kept redoing it until I liked the result. I knew I wanted a bright and cheerful cover, but not one which looks like a children’s book. I decided on a flower and chose a sunflower. I drew out the flower but somehow it just did not work. The colours never seemed to gel and the impact just was not there. The first panel at the top left shows the first attempt and then, I tried to play with the colours but gave up on the sunflower. I looked around for another flower and thought of the rare blue Himalayan poppy, a favorite flower of mine. The third picture on the top row is my rough drawing of it growing out from a book. The book is about visualizations so that image seemed to fit. The flower did not look real. I studied photos of it went back to work. The three photos on the right show the progression as I chose a blue – yellow, contrasting colour scheme, finished the flower and added the background. The size turned out wrong so I had to resize it as you can see in the bottom panel on the right. The drawing was too big and not enough room was left for the title. After all, its a book cover not a piece of art. It’s like an ad for the book so title takes precedence. I reduced the size of the drawing. And finally I got what I wanted. Then I only had to add the text. Which took another few days playing with fonts and placement. Then I sent it out to a few friends and they approved. I had lots of fun doing it and liked the end result. Now on to the next book and the next cover. My latest book is up. A book of tiny meditations to relax and de-stress you. Just published and available as a ebook on Amazon. 46 little meditations which take no more than five minutes of your time. The powerful visualizations will keep your mind happily occupied. Take a quick and relaxing meditation break with your coffee break. I had a lot of fun writing this book and years of work have gone into it. The meditations have been developed by working with groups over a couple of decades. Trial and error until I found the ones which worked the best. I had the scattered notes over the years. I put them together and added a few new ones for this book. My classes may recognize a few, but not all of them. I had fun doing the cover too. I knew I wanted a flower and at first I tried a sunflower. Just a few yellow petals, but it did not work. Finally I decided on this rare flower – and a favorite of mine – the blue Himalayan poppy. It seemed to symbolize the magic and the delight which I hope the meditations will bring you. Here is a sample meditation so you can see what they are like. Create your own Valley of the Flowers, just like the one in the Himalayas where there are flowers as far as the eye can see. You can have that too – in your mind. Look around your room and imagine it full of flowers. Turn your sofa into a row of flowerbeds. Let roses bloom or add a pool of blue lotuses. Let the walls dissolve into a field of sunflowers. Visualise your favourite flowers growing all around you. Look at the brilliant colours and shapes. Inhale the wonderful perfume. In the mind you have no restrictions at all. Seasons and species do not count. All species can grow side by side and bloom around the year. Space is not a constraint either, even if you are in a very tiny room. It can blossom into a vast garden in your mind. Every species can bloom together. Lotuses can bloom on land and poppies can sprout from water. You can have a carpet of marigold or a mountain of lilies. Mayflower can have orchid petals. Anything goes and these flowers never go out of bloom. Be lavish and be creative. Enjoy the Valley of the Flowers right there around you anytime you like. Challenge yourself every time to create more and more wonderful flowers and more exciting and beautiful vistas. This is a very cheerful little visualisation which you can use any time life seems grey. Give yourself a boost by imagining the flowers. The more you let your imagination go, the more happiness this meditation can bring you. Become a child again and just lose yourself in a fabulous world of flowers. 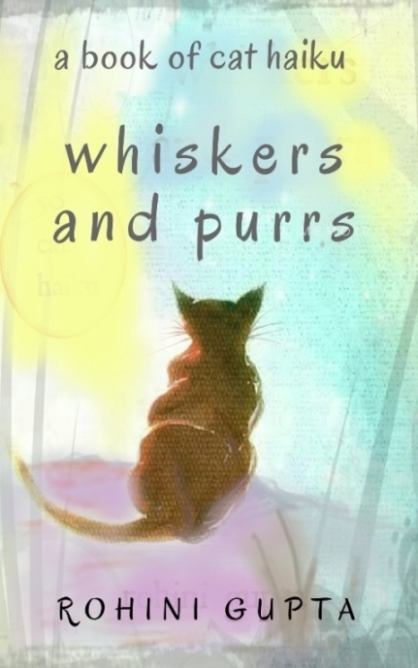 whiskers and purrs – a book of cat haiku – which I published a few days ago is doing very well at the moment. Its at the top of the haiku list on Amazon.in. A very big thank you to all the wonderful people who bought it. Having a lived a lifetime with cats and having spent the last decade with haiku as a poet, reader and editor – this is the result. A book of cat haiku. 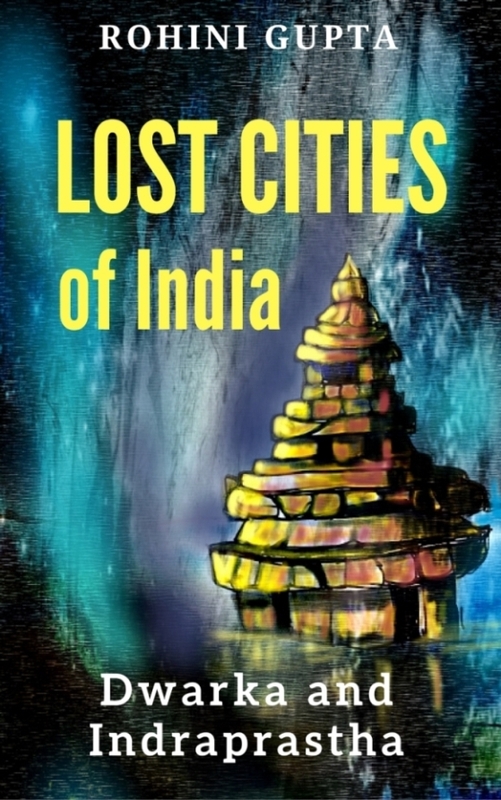 Now published as a Kindle ebook on Amazon. I had fun writing it, drawing on all the cats who have stalked through my life, each bringing an special fragrance to it. Each one is an individual and quite a character on her own. I also had fun doing the cover and I quite like the airy feel of it. World Haiku Review carried a preview of my book HERE with the introduction and some photographs from my large collection just for the preview. There you will see some of the characters who inspired the poems.